My last affair at Si Chuan Dou Hua was their Peking Duck promotion. This round, I am at my favorite Szechuan restaurant for a Dim Sum Feast Promotion and a Masterclass in Dim Sum and Noodles by Master Dim Sum Chef Peng Yi Chun. Hailing from the award-winning Si Chuan Dou Hua in Singapore, Chef Peng’s culinary showcase marked the launch of Si Chuan Dou Hua’s Dim Feast at PARKROYAL Kuala Lumpur starting from 1 November 2014 to 31 January 2015. Master Dim Sum Chef Peng Yi Chun of Sichuan province may look young but he comes with over 20 years of experience and graduated from Sichuan Culinary School. 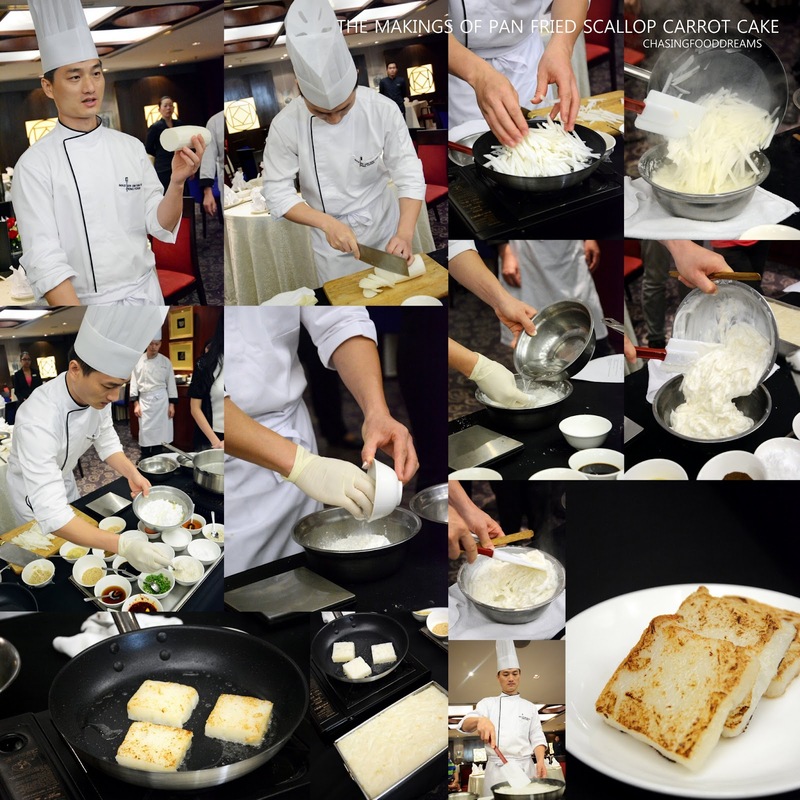 Chef Peng acquired 10 years of dim sum making experience in Chengdu before joining Si Chuan Dou Hua Singapore in 2005. He believes solid and strong foundation skills coupled with passion and creativity is the key element in creating exquisite dim sums. Chef Peng takes pride in challenging himself to breathe new life into traditional dim sum dishes through their flavours and presentation. Chef Peng’s mouthwatering lists of 58 dim sum dishes are showcased in the Dim Sum Feast promotion. Gourmands and foodies are treated to a mouth-watering Sichuan and Cantonese dim sum and noodle feast. The Dim Sum Feast promotions have diners selecting 28 items from the broad menu at only RM58 per person. Our review kicked off with Master Dim Sum Chef Peng sharing three recipes from his repertoire. Of course he makes these looking fairly easy but we all know that it takes skills to create these dim sum and noodles. First up is Minced Chicken Dumpling in Chili Oil. Morsels of minced chicken meat flavoured with scallion and ginger water encased in thin dumpling skin is skillfully wrapped and cooked in boiling water before being laced with Szechuan chili oil sauce made from red chili oil, sesame oil, sesame and spring onion. Our third master class recipe is a Sichuan classic, the Sichuan Dan Dan Noodle. The noodle is blanched and smothered in a filling of minced chicken with Sichuan preserved bean sprout and a mouth-tingling spicy sensation of flavours. 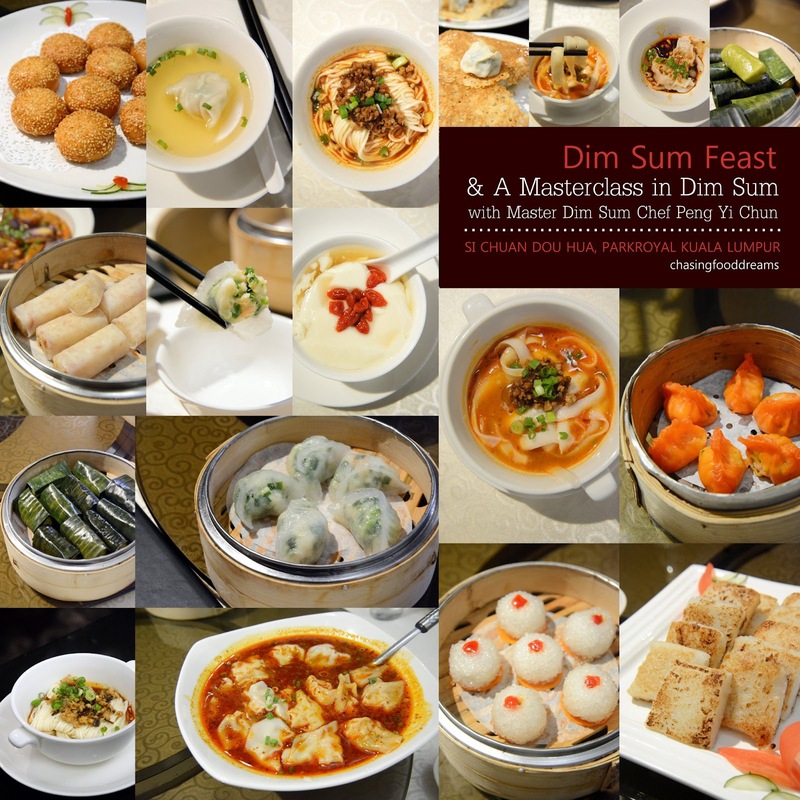 Here’s a long peek at the list of dim sums available in the Dim Sum Feast promotion. Besides these, there are so much more including classic dim sums and other dishes. Steamed dim sum was next and the first one was Steamed Chive Dumpling. Translucent crystal skin enrobed a filling of prawn and chives. Succulently sweet with loads of oniony chive flavour and texture, the dumpling is very well crafted. If you love chives, this dumpling will certainly be in your favor. I didn’t know what to make of the Minced Chicken Dumpling Wrapped in Banana Leaf but at sight, it was certainly dainty. After unwrapping the banana leaf, a long cylindrical dumpling tainted a natural emerald green looked so pastel and pretty. Filled with a sweet and savory minced chicken filling, the dumpling has a unique chewy texture achieved by precision cooking time and method. Truly unique and delicious, I had two of this yummy dumpling! 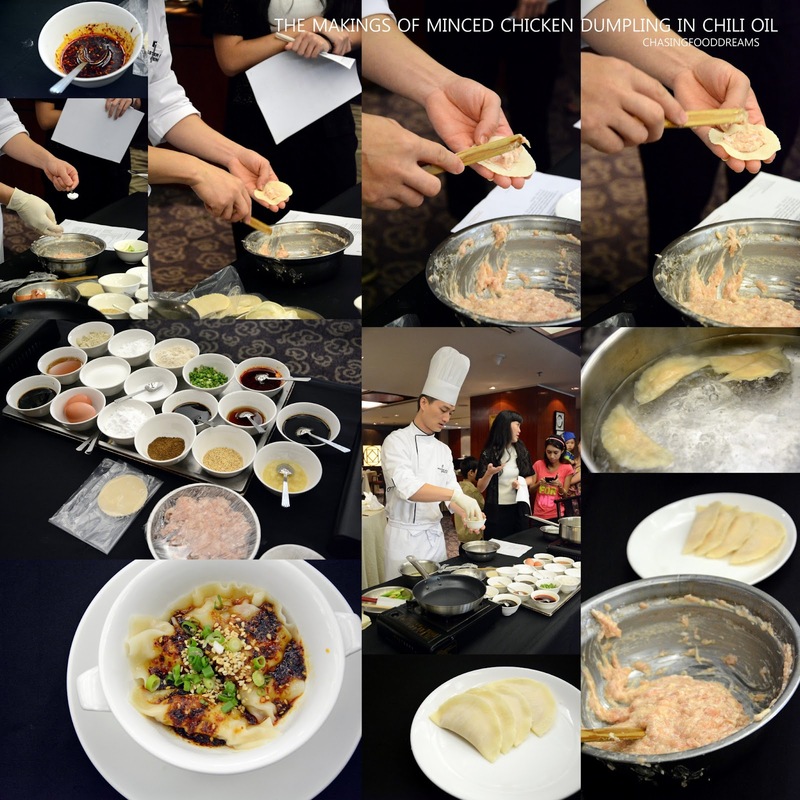 Next was one of the master class recipes, the Minced Chicken Dumpling in Chili Oil. Chef Peng’s skillful rendition of the dumpling made with chicken is really admirable. There is a lovely tender texture with a good bite in the dumpling that is usually more notable with the classic pork. The piquant spicy Sichuan sauce hit every note it should with its robust and tingling numbing heat sensation on my lips. Another version of the dumpling we had was the Minced Chicken Dumpling in Hot & Sour Soup. Served piping hot, the dumplings are now drown in a hot, sour and spicy soup laced with the Sichuan flavours and chili. I really enjoyed this one too and was happily drinking the soup. Its super punchy with lots of sourness and spiciness that gets my adrenalin pumped up. We also had the master class Pan Fried Carrot Cake. Good robust radish flavour and aroma rules and I was pretty satisfied with the tender and creamy carrot cake. The nice crisp edges made the carrot cake even more delectable. Happy to have the recipe to this very delicious carrot cake, I am definitely going to replicate this at home. I really like it a lot whenever I see pan fried dumplings prepared with a crispy pancake crust like this. Its quite an added bonus as the crispy edges gives the Pan Fried Minced Chicken Dumpling with Chives another crispy texture contrasting to the tender steamed cooked dumplings. These were moist and well balanced with flavours. Steamed Glutinous Rice with Dried Shrimp Wrapped in Yam is also another unique dim sum that I have never had before. Showing off super thin yam wrapping lightly sweet and soft glutinous rice jazzed with dried shrimp, this one taste as good as it looks. The yam skin literally melts-in-the-mouth with a luscious creamy note. The glutinous rice is also cooked well, not too soft and one can still taste the rice grains. The flavours here leaned more towards a sweeter note and borders on the edge of being a dessert. Though not part of the dim sum usual, we were still more than happy to savor the Braised Eggplant with Garlic & Chili Sauce and Stir Fried French Beans with Minced Garlic as these are also signatures of Chef Peng. Both dishes beckons for a bowl of steaming white rice as their flavours were gorgeously moreish and scrumptious. The eggplant has a robust savory and umami note with loads of garlic and chili while the French beans were beautifully crunchy with tinges of sweetness and saltiness from the preserve vegetables. Our main highlight of the event had to be Chef Peng’s live demonstration of the Sichuan knife shredded noodle action. Now I have had knife shredded noodles before and I have absolutely adored it. 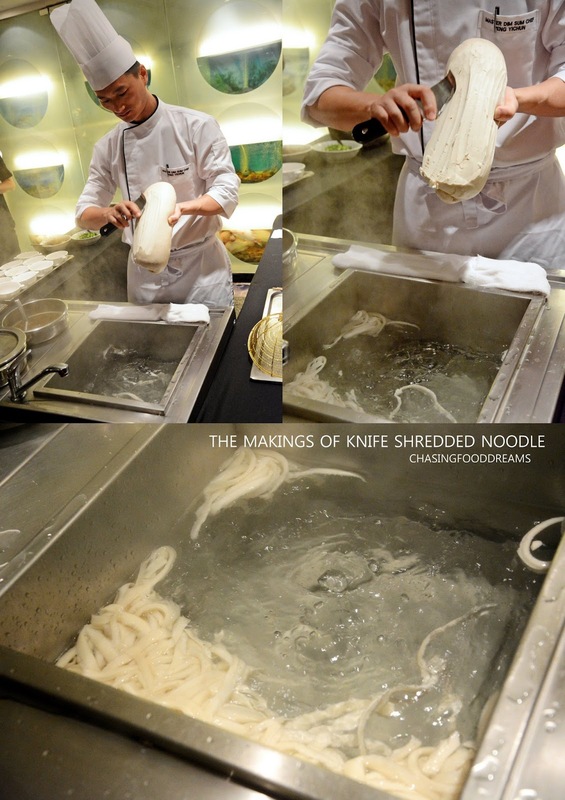 Using a curve thin knife blade, the chef has definitely carved out noodle strands from a big oblong block if dough straight into a pot of boiling water. The blade produces the unique texture of a thicker middle with thin edges on each strand of noodle, giving us a balance of firm al dente middle and soft edges together upon each slurp. So whenever I see knife shredded noodles on a menu, it’s simply a must order for me! At Si Chuan Dou Hua Dim Feast, one can have the noodles in two options, the regular thin strands of noodles or the knife shredded version. If you ask me, go for the knife shredded version for more bite. The noodles are served in a spicy and light sour broth that is unctuously delicious. Minced chicken meat and scallions completed the delectable Home Made Knife Shredded Noodles. There is also a non-spicy chicken broth for these noodles if you do not like spicy flavours. Our last savory dish of the feast was another Sichuan favorite and our master class recipe of Sichuan Dan Dan Noodles. The noodles have a very good bite and seemed to take on the spicy nutty Sichuan sauce very well. Served with what we saw was the preserved vegetable chicken filling which added more depth of flavours and textures to the noodle. I really enjoyed the spicy and immensely nutty peanut sauce a lot. Dessert was really incredibly gorgeous at sight! We all literally went gaga over the sight of the jeweled balls of Steamed Glutinous Rice Ball with Purple Sweet Potato Paste. It’s really too pretty to be eaten in my books. Beautifully crafted to a size smaller than a golf ball, the mochi like dumpling has a creamy sweet purple sweet potato mash and is studded with crystal pearls of sago balls. These were daintily placed on slices of carrot and steamed till cook. It has a soft creamy texture with a light chewy note. The translucent sago really added a glorious touch to the dessert. Now obviously it would be without question that we also enjoy Si Chuan Dou Hua’s all time signature Home Made Fine Bean Curd with Wolfberry. As always, the consistency of the bean curd texture is executed spot on. Coupled with the wolfberry infused syrup, this is always a winner for me as a sweet comfort ending. Don’t miss this feast, it’s a dim sum feast to be reckon with as it has loads of unique dim sum dishes to be savored. Priced at RM58 nett per person, the Dim Sum Feast is available for lunch from 12noon to 2.30pm from Mondays to Fridays and for brunch from 10.00am to 2.30pm on Saturdays and Sundays. Special savings apply for selected bank card members. 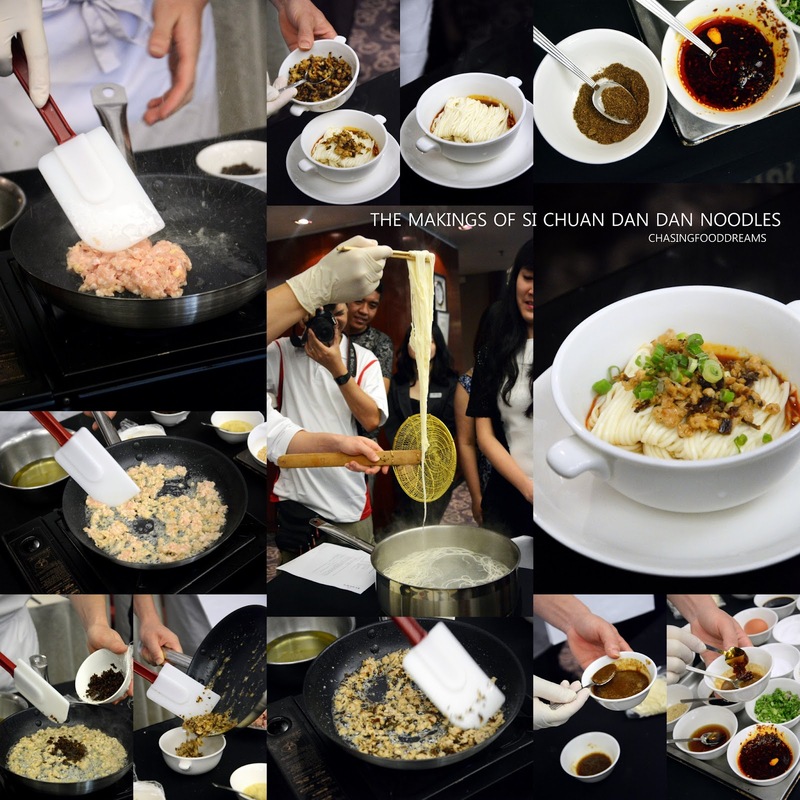 Si Chuan Dou Hua’s Dim Feast is available from 1 November 2014 to 31 January 2015.
yummy! I would like to get a chance to try them too.